July takes us into the throes of summer and a time which is often marred with oppressive heat. Thirty-four of our fifty nifty US states have set their all-time hottest temperature in the month of July. That includes the scorching 134°F high temperature recorded in Death Valley in 1913 – the hottest temperature recorded on the planet! Elsewhere, slow moving weather patterns, some with tropical influences, can bring copious amounts of rain to a region. Storms like Dennis and Bertha left lasting impressions along the southeast coast with many more smaller and unnamed systems to list. But what did this July have up its sleeves? Let’s find out. Persistent ridging in the western US gave this region one of its warmest months in recorded history. Triple-digit heat was both widespread and lasting, stretching from the desert southwest and inter- mountain locations to even the more temperate Pacific Northwest. 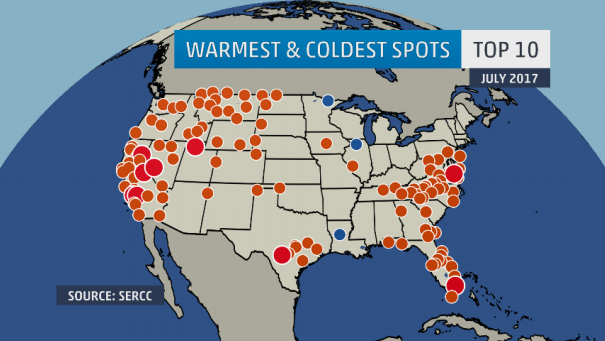 The warmest of these locations was McCall, Idaho which finished the month eight degrees above average. Most people seek higher elevation to escape the heat, but at 5,000 feet above sea level, McCall was no sanctuary. This was McCall’s warmest July and warmest month on record. All 31 days of the month were below average with eight of them at least 10 degrees above. In a month where their high temperatures average between 74 and 81 degrees, 2017’s temperatures ranged from 80 to 93. 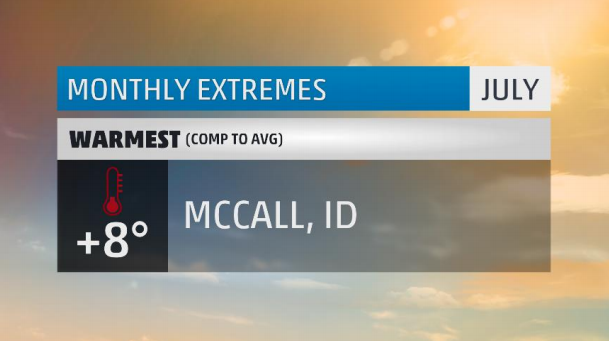 McCall had ten 90 degree-or-better days which is the most for any month on record. They also witnessed their 2nd longest heatwave with five 90 degree days back-to-back. And if that’s not enough, six daily high temperature records were broken. Elsewhere, the coasts baked this July. One hundred and fifty-two cities had one of their top 10 warmest Julys on record including Miami and Reno which had their warmest. What was all but absent in the US this July was prolonged stretches of cool weather. One place that managed to see some was New England where backdoor cold fronts and latitude can help a little. 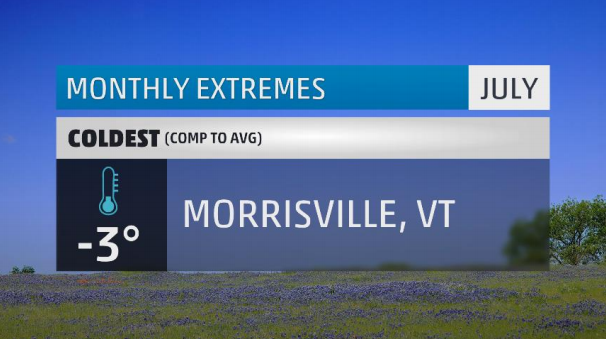 The coolest spot this month was Morrisville, Vermont which had its third coolest July on record. Twenty-two of the month’s 31 days were below average. Its warmest high during the month was a measly 84 degrees (I’m sure a lot of you would love that!). Twelve days failed to reach 75 degrees with another 4 falling below 70. In the morning, temperatures dipped into the 40s on four separate occasions. The culprit for Morrisville’s cool was the progressive nature of the weather pattern…at least where they are located. Seven cold fronts passed through the area in July, each ushering in a reinforced shot of cool, Canadian air. That sounds like my kind of summer! Meanwhile, the southeast was begging for a cold front to pass. Instead, as is common in the summertime in the southeast, fronts stall and create ample opportunities for locally heavy rainfall. The target this July was north Florida. Our wettest city in none other than Gainesville, Florida – home of the University of Florida Gators. Gainesville picked up nearly 17 inches of rain in July which is the new monthly record. It was also the 2nd wettest month on record just behind June 2017. That’s right; Gainesville just had its two wettest months on record back-to-back! Twenty-five of the month’s 31 days had measurable rainfall, six of which had at least an inch. 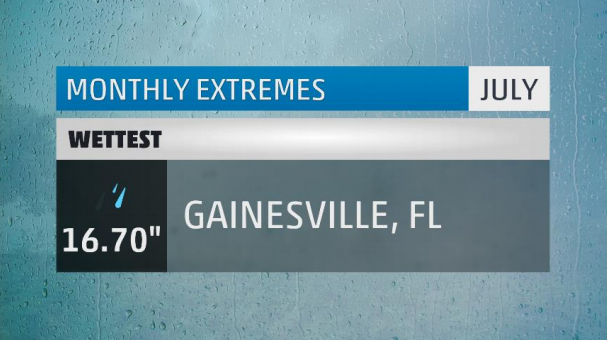 In one week, Gainesville picked up an impressive 10 inches of rain. All in all, Gainesville ended the month 10 inches above average for precipitation and broke five daily rainfall records. Sounds like weather only a gator could love. The mid-Atlantic was another soaked spot this month. One location in particular is Harrisburg, Pennsylvania, where the city picked up 4.27” of rain in just one hour! That would wind up being a one- in-one-thousand year event for the Keystone State. On the flip side, it was hard to find a drop of rain under the month-long ridge that baked the Pacific coast. 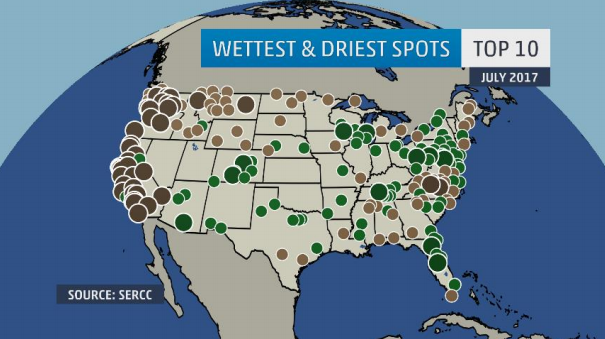 Many locations tied or broke their record for driest July on record, and some 41 cities didn’t see a single raindrop fall from the sky! In typical July fashion, no snow was reported across the weather service’s network of almost 900 weather stations. And go figure, with all the dry and hot weather out west, someone had to be soaking up the sun. This month’s winner of sunniest place in the US is Walla Walla, Washington. In July, Walla Walla didn’t have a single day that averaged more than zero percent total sky coverage. They only mustered a trace of rain which came courtesy of a passing shower that lasted for just five minutes. It was bookended by brilliant sunshine. 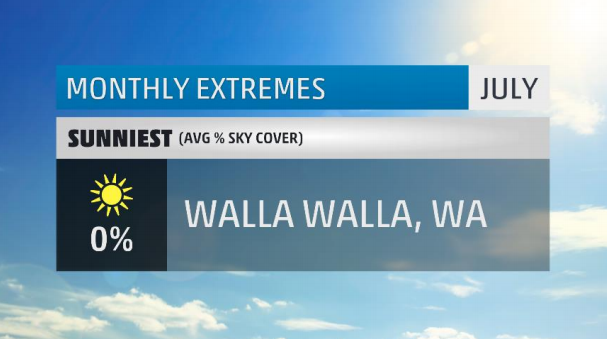 For the month, Walla Walla was five degrees above average and had a whopping twenty- seven 90o+ days. It was their 3rd warmest July and 5th warmest month on record. That trace of rain was enough to tie for the second driest July. On average, Walla Walla is cloudier than the rest of the US with 188 sunny days per year. But, with 31 straight days of sun, I think they’re bucking the trend this year. The city of brotherly love was a victim this July. A victim of the dreaded “ugly warm-up”. What’s an ugly warm-up you ask? Ugly warm-ups are periods of warmer weather that are accompanied by clouds and/or wet weather. In Philly this July, that very thing happened not once, not twice, but three times! 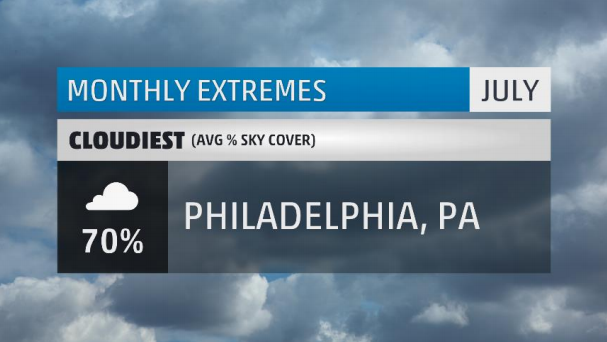 Three separate heat waves hit Philadelphia in July, and each were during periods of mostly cloudy skies. The heat waves were split by storms that brought heavy rain and cooler weather. But whether Philly was in the heat or the not, they could not shake the clouds. Not even the 4th of July was spared as cloud cover and heavy rain put a big damper on fireworks and festivities in the birthplace of our nation. Only four days the entire month could be considered mostly sunny. Blech! There you have it, the extremes for the month that was July 2017. Make sure to check back next month to see what August has in store. What weather extremes did you face in July? Let me know in the comments below. Walla Walla is a great town surrounded by amazing wineries 🍷. Had a chance to visit there in Aug for the first time, highly recommend it!